In Silicon Valley it’s not just who you invest in that matters– it’s also when you invest in them. The earlier the investment, the riskier the bet. But the more jawdropping the returns if the company hits it big. It’s so lopsided, that typically just 5% of those unsure, early bets create some 95% of the entire venture industry’s returns. Miss one of them, and it haunts you for years. Snag it, and you can brag for even longer. This simple reality is precisely what makes the venture business hard, and the justification for why partners make such huge fees. So what’s up with the surge of the strongest early stage firms jumping so heavily into late stage mega-deal fray? Have the Valley’s superstars lost sight of these rules or are the rules changing? Earlier this year, we wrote a lot about the shift in power at the early stages with the rise of super angels, but you could argue there are far greater ripple effects to this new late stage frenzy. That’s not only true for the Valley, it’s true for Wall Street. And you could argue, those ripple effects are less well-understood. Super angels move small chunks of money, hedged across thousands of startups. Worst case, they all go belly up. More likely, the bulk of them barely return capital and a few do really well. Either way, plenty of angels will make bad bets and stop being angels, but the financial damage is otherwise pretty limited. There are plenty of jobs awaiting even the most outrageously failed entrepreneurs. But the billions of dollars in late stage deals being invested by the top firms in Silicon Valley are another matter. First of all, we’re talking about far bigger chunks of cash, mostly from pension funds and endowments. And these firms are making investments in the handful of sure $1 billion-plus winners that Wall Street and the Valley have spent more than a decade of sub-market returns waiting on to mature. Each deal represents dozens or even hundreds of people cashing out, while others take on a greater risk. And each deal represents another delay in companies like Facebook or Zynga going public. And quietly there’s plenty of grousing going on about the trend. Some of it is pure player-hating, and some of it raises good points. For example, the vast majority of VC firms who can’t raise a $1 billion expansion fund cry that these new mega-funds aren’t real venture capital investing, they are firms acting like hedge funds. Some allege they are even abusing their positions as the current darlings of the venture world to make huge trades in well-baked companies without any board obligations, but still get paid like VCs with huge management fees on these mega funds. Within the elite Sand Hill Road club, VCs snipe about who is still adding value and draw distinctions between a negotiated late-stage deal and a pure secondary stock purchase. And, those who were smart enough to get in early on a giant like Zynga, Twitter or Facebook, chafe when a VC that’s thrown money at a rich secondary valuation now proudly lists those companies as core companies in their portfolios. And then there are early stage companies hoping to disrupt giants like Zynga and Groupon and wonder if they should take money from a firm who is placing a much bigger bet on the well-funded giant. You could argue a firm staying out of the late-stage fray entirely may have a marketing advantage with them. And, as always, in the press there’s the page-view grabbing panic over whether the multi-billion dollar valuations are a sign of another bubble. There’s even plenty of moaning about the deals on the east coast: At the Securities & Exchange Commission alarm bells are going off about whether these massive trades are just clever routes to skirt disclosure of a public stock. New York investment banks are furious that these deals allow anticipated IPOs in companies like Facebook to be put off as long as the company wants– robbing them of those lucrative banking fees. If they want a piece of the pie, they’re relegated to selling limited shares under huge restrictions, ala Goldman Sachs, or cozying up to an industry insider like JP Morgan did with Chris Sacca. It seems the only ones who unabashedly love the trend are the handful of companies who now have free money whenever they want it at seemingly any price, without any of the downsides of going public. Over the next few weeks, we’re going to do a couple articles digging deeper into this trend, the most important players and what it represents for the startup world and the tech markets at large. First, we wanted to pierce the marketing spin and shine a light on who has done what– and when they did it. What’s unique about this trend is how huge the amounts of cash and valuations are, yet how small the number of players are. Only a small portion of firms can raise this kind of money and have the right connections to get into the best deals. Likewise as the Valley has become more polarized between huge winners– who raise hundreds of millions of dollars and employ thousands of people– and the small lean startups– who are built to flip– there are only so many deals that can justify these sums of cash and these valuations. But that doesn’t mean companies that probably shouldn’t get funded at these prices won’t. The several-billion-dollar-question worrying many limited partners is how speculative this trend will get. While most of these deals and prices had been reported before, a few things jumped out at me once I collected the data in one place. It’s clear the quality of deals is slipping. When DST pioneered this category, the firm was adroitly responding to a gaping market need. These companies needed huge amounts of cash to scale to the unprecedented 1 billion person online market potential, but the IPO market was closed. That’s no longer the case. “Oh, how it’s no longer the case! Please, dear God, call me!” some poor banker is no-doubt lamenting, reading this post. Today, the best companies of the last ten years have all raised late stage money, and the prices are no longer a bargain. There’s only so fast that pipeline can fill back up. While I could argue $50 billion is a fair market price for Facebook, I find it hard to argue that Twitter is worthy the same or more than cash-generating Groupon or Zynga, given Twitter has gone through three CEOs in its young life, has no clear product visionary, and still isn’t making much revenue. Far more egregious: The idea that Spotify, which hasn’t been able to launch in the US despite more than a year of trying, is valued at the same price as soon-to-be-public Pandora. We’re seeing a clear move away from no-brainer bets towards more late-stage speculation. History has never shown that strategy to produce venture-style returns, said several top limited partners on the condition of anonymity. But more remarkable is what this chart tells us about the fortunes of Silicon Valley’s top venture firms. For all the headlines that late stage is simply something “everyone is doing,” this chart shows a dramatically different story. Behind these red and green boxes lurks the same kind entrepreneurial drama that usually goes on in the companies VCs back. 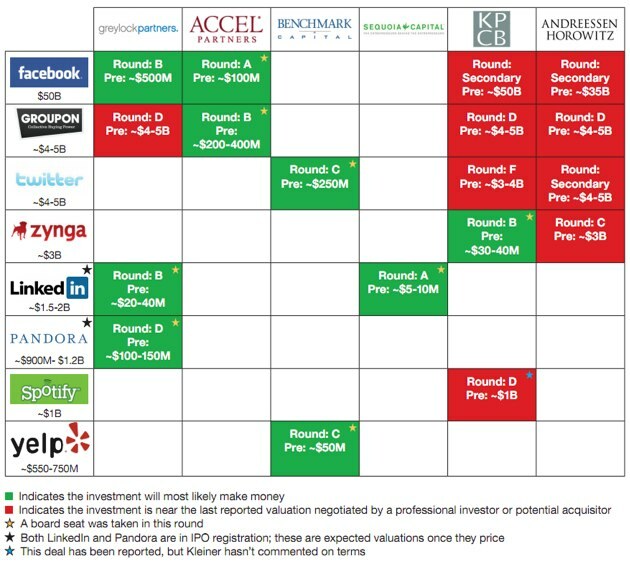 While dozens of venture firms are quietly going out of business for the first time in more than a decade, this chart represents the haves. And yet, there’s still plenty of drama as they grapple for position in this new venture reality. This chart shows dramatic comebacks. In the wake of the dot com crash, limited partners privately told me that Accel Partners was one of two major firms that would never raise a fund again. When I mentioned this to Jim Breyer in 2006, he didn’t deny it. But he almost single handedly pulled the firm back from the brink. Accel missed Twitter and Zynga and others, but who cares? If you do the math, Accel is all but certain to have the best returns of the lot based on that $100 million bet on Facebook alone that seemed crazy at the time. The price the firm payed for Groupon is the icing on a massive Web 2.0 cake. Similarly, Greylock had virtually no presence on the West Coast and no brand in consumer Internet. An early investment in LinkedIn and comparatively early investment in Facebook catapulted the firm into being one of the top names. And aside from Groupon, Greylock’s late stage bets haven’t been as valuation-aggressive as those done by other firms. If Pandora’s IPO prices where analysts expect, that $150 million valuation will look like a bargain. On the other side of the chart– literally and figuratively– are Kleiner Perkins and Andreessen Horowitz, the two most aggressive at the late stage game, but utterly different stories are behind the common strategy. 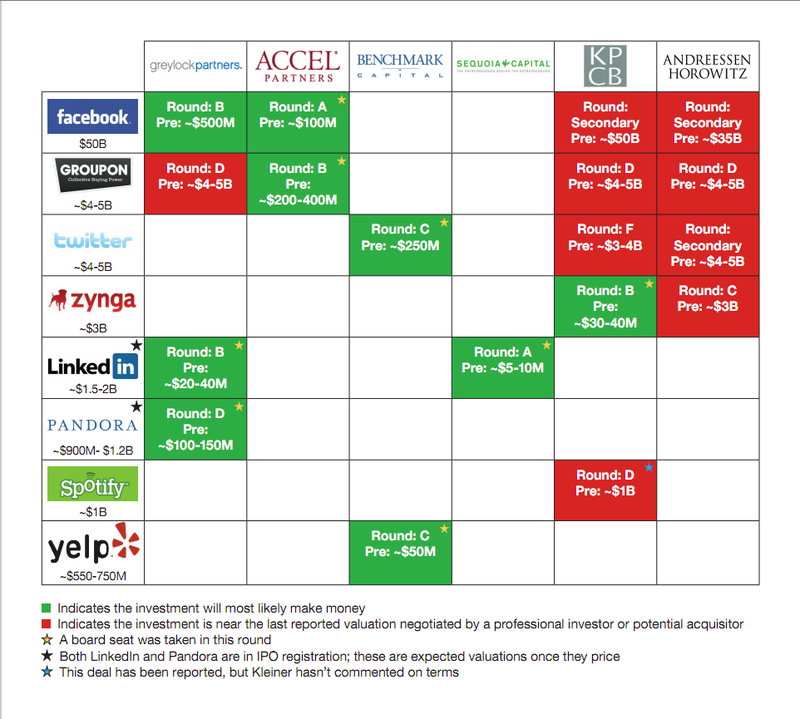 Andreessen Horowitz was formed after most of these companies, so getting in early stage rounds was impossible. But that doesn’t mean the firm’s partners were late to the Web 2.0 movement. The graph doesn’t include Marc Andreessen’s personal angel investments in Twitter and LinkedIn, nor does it include his position as one of Facebook’s few board members, because it happened well before he invested. For Andreessen Horowitz, the emphasis on late stage deals doesn’t represent any sort of shift. The firm was founded explicitly to invest in the best companies whenever the partners could get in. This was clearly telegraphed by the firm’s first deal: A beyond-late-stage investment in the already-acquired Skype. Kleiner Perkins has been a different story. This is a firm that largely missed the early days of the Web 2.0 movement and has jumped back into it aggressively in the last year. The centerpiece of the strategy was a relatively early investment in Zynga. To be fair, this chart doesn’t show the early stage bets they’ve also been making in companies like Shopkick, Path and Klout. The success Kleiner has had reclaiming Web relevancy has been a testament to the lasting power of brand in the startup world. Few firms could have pulled it off. But plenty of people have questioned the prices they’ve paid to get back in the game– especially at the later stages. In both the cases of Andreessen Horowitz and Kleiner Perkins there’s plenty of industry eye-rolling when the firms rattle off investments in these very late stage deals as sample portfolio deals. Give them credit for getting shares in these scorchingly hot companies even at these prices, but its important for entrepreneurs and the press to realize when they invested. That leads us to Sequoia and Benchmark– the two firms that are the most absent when it comes to these companies. Not reflected in this chart are Benchmark general partner Matt Cohler’s personal stakes as one of the earliest employees of LinkedIn and Facebook. Indeed, while Benchmark has resisted buying Facebook shares, Cohler has funded some of the most exciting companies to spin out of the Facebook mafia including Asana and Quora. The real surprise is Sequoia — a firm that was known in the 1990s for flawlessly picking nearly every consumer Web giant. While this chart doesn’t count the stellar return from YouTube or promising recent investments like Square, LinkedIn is the only sure-winner it has a large stake in. I wanted to keep this graphic focused on the top traditional Valley firms, but there are two obvious omissions. One is DST, which started this trend with its aggressive investments in Facebook that now seem boringly reasonable by comparison to recent deals. We’ll have more on DST’s impact in a future post. In nearly 15 years reporting in Silicon Valley, I can’t think of another outsider who has so dramatically beat the Sand Hill Road establishment at its own game– not to mention redefining that game for them. No easy feat in a Valley awash in too much cash to begin with. The other omission is a Valley outsider too: Union Square Ventures, the earliest investor in Zynga and Twitter. There are no signs of Union Square getting into the $1 billion fund game although it has raised a later stage fund called The Opportunity Fund. But at just $165 million, it’s not nearly as large or aggressive. It’s mandate is selectively investing in companies with a valuation north of $100 million– that’s still pretty early compared to what’s going on in the Valley these days. And Opportunity Fund usually invests in companies already in Union Square’s portfolio, says general partner Fred Wilson. In terms of returns, we hear that Union Square has sold enough of its Zynga and Twitter stakes to repay both funds and still leave it with plenty of upside. In terms of bragging rights, Union Square has bested these Valley insiders at the early stage game with at least two of our billion-dollar winners.